Looking for an adrenaline filled hobby? Great! Check out our 10-minute beginner’s guide to kayaking, and get yourself paddling! Welcome to our 10-minute beginner’s guide to kayaking. If you’re looking for a new hobby – something that involves the outdoors and adrenaline – you’ve come to the right place. We’ll be covering everything to you need to know to get started with kayaking. If you know what you’re looking for you can use the menu on the right to jump to a specific section. Otherwise… let’s get started! So, what do you need to start kayaking? The type of kit you’ll need will depend on where you plan to kayak (sea, canals, white-water etc). But, let’s outline the basics that every kayaker needs to get out and start paddling. Well, that’s going depend on the type of kayaking you plan to participate in, whether you go high-end or low-end, and second-hand or brand new. Our choice? We’d be looking at second hand kayaks for sale. Brand new kayaks can vary from $400-$1000, but that doesn’t mean you have to pay that much. There’s a huge array of kayaks for sale on eBay that are second hand, and offer savings of up to 50% in comparison to buying one brand new. Remember, even kayaks designed for the same type of water are going to feel different. 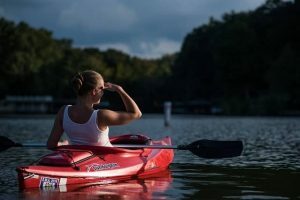 So, until you get out on the water, and try other kayaks, it’s going to be hard to figure out which kayak is going to suit your paddling style. You’ll need to budget $250-300 for a quality used kayak. If you feel you need to upgrade, it will have lost little value, so you’ll be able to re-sell it for the exact kayak you want. Next, you need a good set of paddles. Yup, you only need one, but we’d always advise strapping on a spare. You will lose a paddle at some stage, and when you do, it’s going to be hard to get anywhere without a spare. There’s a range of cheap paddles for kayaks starting at $30, and they range upwards from there. If you’re on a tight budget, make your main paddle a high quality one, and strap a low-end paddle on as a spare. Next, you’ll need to grab yourself a wetsuit. 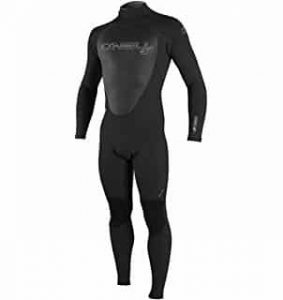 Most quality brands will offer a range of wetsuit thicknesses designed for different temperatures. But, choosing a wetsuit doesn’t depend on the outside temperature. Water temperature (especially in the sea), is rarely connected to the weather. 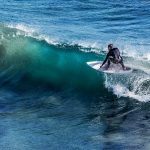 So, you’ll need to check water temperatures before deciding on what wetsuit is going to be suitable for you. In the 0°F range, you’ll want a 6/5/4 sealed wetsuit. Gloves, boots and a hood won’t go a miss here too. Below that temperature, you’ll want a dry suit. If you’re going to paddle in water around 45°F a 5/4/3 will be sufficient (again, with gloves, booties and a hood) and at 55°F a 4/3 will be good enough. I’d ditch the gloves and hood here. Above 60°F you’ll only need a 3/2 and above anything beyond that a 2/3 will do the trick. Although you’d get away without a wetsuit in any temperature above 70°F, I’d advise not doing that (especially if you’re planning on white-water kayaking) – rocks really hurt – wetsuits offer protection. At the very least, go with a shorty 2/3. The same goes for booties, they are good foot protection, and I always where them. After a while, wetsuits can get irritating, this is particularly the case in salt water, as it dries out the skin. If you want to keep comfortable throughout your day, I’d suggest buying a rash guard. 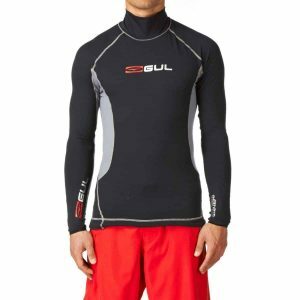 O’Neill do a cool range of wetsuit rash guards for men and women starting at $20. 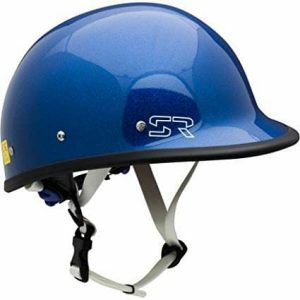 If you’re kayaking in water where there’s even the slightest chance of hitting your head during a roll, you’ll want a helmet. In fact, it’s advisable to wear one regardless. I’ve surfed kayaks and seen others roll (without a helmet as it was deep water). The problem is, when you roll in rough surf (or white water), there’s a good chance you’ll lose your paddle. And, that paddle won’t stop surfing a wave just because you do – they hurt when they hit you on the back of the head! You shouldn’t ever go kayaking without a buoyancy aid. Kayaks are incredibly easy to capsize. And, there’s always a small possibility that you could hit your head. A life-jacket for kayaking is a safety precaution and a life line; it shouldn’t be overlooked. 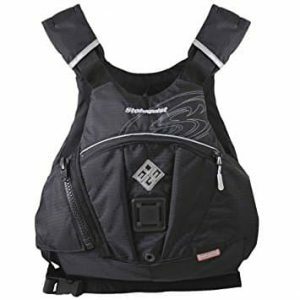 Check out our buyer’s guide to the best life jackets for kayaking here. As we mentioned in the wetsuit section, you’ll need a set of gloves when paddling in temperatures below 55°F. 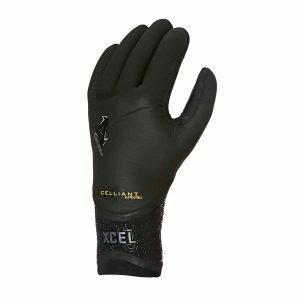 There’s a tonne of high-quality brands (such as Hyperflex, O’Neill and Xcel) offering gloves from $20. If you plan to kayak regularly in cool conditions, they are going to be a necessity. 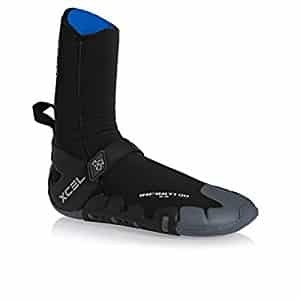 Most people assume wetsuit boots are only used in freezing conditions. Whether I’m surfing or kayaking, I wear wetsuit boots. They don’t just keep your feet nice and cosy, but they also protect them from rocks. And, it also means if your miles away from your vehicle, when you land, you’ll still be able to walk around without cutting your feet to pieces. Now you know all the gear you need to start paddling. But, there’s not just one type of kayaking. Which type is suitable for you? The type of kayak you need depends on how serious you are about the hobby, and the types of water you plan to paddle on. If you plan to paddle for long distances, maybe for travelling, touring could be for you. The area in the kayak for the paddler isn’t sealed, so you need to bear that in mind if flipped. But, there’s usually a sealed area behind the bulkhead to store necessities. Due to the fact touring kayaks are big and heavy, they are usually used on open and predictable waters. If you plan to go kayaking at sea, you’re going to encounter some seriously choppy waters. So, unlike a touring kayak (although they look similar), you’ll have two sealed bulkheads. Sea kayaks are long and thin (sometimes up to 20 feet long) which allows them to blast through choppy water at speed. Being out at sea isn’t a joke, you’ll need to get some tutoring from a professional before going in your own groups. And, due to their weight, you’ll need some serious power and stamina to keep up to speed. Whitewater kayaks are typically much smaller. They’re designed to tackle rough and rocky stretches of streams, creeks and even rivers. They are designed to be nimble. But, that comes at a cost. 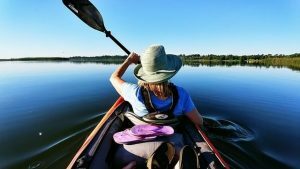 Don’t expect to be able to keep up with touring kayaks if you’re venturing down calm waters like a canal. Whitewater is unpredictable, fast and dangerous. If you want adrenaline; head for the whitewater! Surf kayaking utilises a similar boat to whitewater kayaks. And, like whitewater kayaking, it can be extremely dangerous. Essentially, your kayak is your surfboard, and you’ll be using your paddle to keep on the surf (or flip yourself if you capsize). Whitewater relies on control and precision. Surfing a kayak is similar, but you’ll need something else; bursts of power. Like normal surfing, you’ll need to paddle hard and fast to get past incoming waves when you venture out to catch a swell. And, when you see a swell, you’ll need to have that burst of power to catch it; it’s not as easy as some kayakers make it look! With most sports and hobbies, it’s easy to take baby steps. The problem with kayaking is that you’re dealing with Mother Nature, and it can be incredibly dangerous. You’ll be thrown in at the deep-end; literally. We’d always getting professional instruction before going out in your own group. Whether that’s perfecting paddling technique, improving your flipping technique, or being able to judge unpredictable stretches of water. A kayaking life jacket is going to be more streamlined than the average life jacket. It allows you to fit essentials in your pockets, plenty of flexibility and offers some spray protection. Water is unpredictable, and it shouldn’t be underestimated. 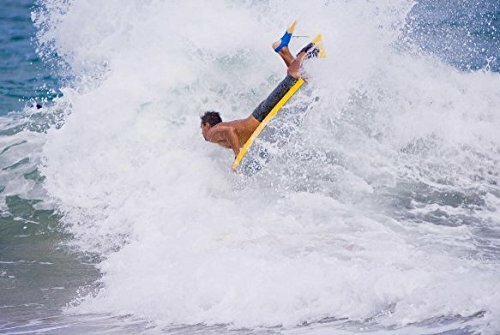 You might think you’re a strong swimmer, but there’s just no telling what can happen out on the water, especially for those surfing and hitting rapids. Some types of kayaking looks tame, others don’t. Regardless, it’s always worth getting a handful of lessons. Bad habits are hard to get out of, so it’s always a good idea to start as you mean to go on. And, you’ll be surprised how basic precautions can help keep you safe on the water. 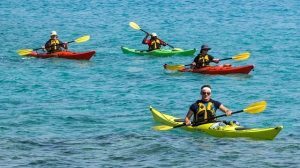 Depending on where you are and the supply of kayaking training in the area, you could be looking at lessons as cheap as $10 per session. That’s a worthy investment to keep yourself safe. Unfortunately, there’s not really a one size fits all approach to kayaking. 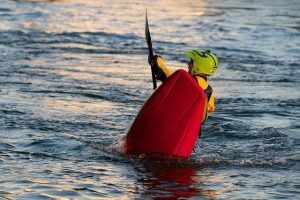 There’s a slight crossover between surf and whitewater kayaking, but apart from that, you’ll want to pick a kayak and paddle, based on the types of water it’s suited to. As an example, a sea kayak is going to be too long and heavy for white water. And, that makes it dangerous. On the flip side, a whitewater kayak isn’t stream lined enough for touring, you’ll tire out in a matter of minutes; and that’s no fun. If you plan to paddle in different types of water, there’s a good chance you’ll need multiple kayaks that are fit for purpose. Every time you’re paddling, be conscious of the balance point of the kayak. Sitting correctly and adjusting your hips will help to counter balance the kayak in rough waters. This is a measure that prevents your kayak from capsizing. A 90-degree upright sitting position will offer the most stability, but you’ll need to feel where the kayaks going, and counter it. The quicker you manage to find a balance point (and counter), the less likely you are to capsize. For whitewater and sea kayakers, don’t dress based on the weather. Oceans are only slightly affected by the weather (mainly because they are so deep, it’s a lot of water to heat up). Sea temperatures are usually a far-cry to the outside temperature. You can see sea temperatures for the USA here and for the UK here. Likewise, because whitewater moves rapidly, it doesn’t have the time to absorb the sun’s heat. So, there’s a good chance it’s colder than you think. Understand the temperature of the water you’ll be paddling in and dress appropriately. Being too cold will reduce you’re paddling strength. More importantly, your body must work overtime to heat up your body, and if you don’t have enough energy to roll after capsizing, it could be fatal. Refer to our kit list to see what you need, for every type of water temperature. If you’ve just had a lucky escape, and have lost your kayak or paddle, don’t chase it. Look around, check everyone else is OK, and get to safe ground. There’s a good chance you’ve been caught out in an unpredictable area of water, and it makes no sense going further into it. Never underestimate the power and danger of water. Never go kayaking alone. If you don’t have someone willing to come with you. Don’t go. Don’t have any family or friends that fancy the challenge? There’s a tonne of cool places to find fellow kayakers. But, how do you find people to go kayaking with? Meetup.com have a worldwide group of meetups for kayakers. There’s currently over 2m members and 2,000 meetups. There’s a tonne of kayaking clubs out there. In the UK, we have the British Canoeing where you can find over 400 clubs and kayaking centres. Likewise in the USA, there’s American Canoeing. If you are looking at a surfing kayak, join local surfing forums, meetups and go to local surf spots. I used to surf boards and kayak surf with the same group of people. 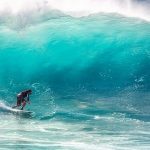 If you are looking for surf spots. I’ve only ever relied on one resource, and that’s Magic Seaweed. It’s a huge community – they even have surf forecasts and surf cams at many of the spots. So, you can see exactly what the swell is going to be like before you set out. Still stuck? Drop into your local kayaking store and ask the sales staff. There’s a good chance they kayak themselves, and they know local groups that are always welcoming new members. Hopefully, you already plan to grab a few kayaking classes designed for beginners. Not all kayaking schools will offer in-depth safety classes that cover rescuing yourself and others. This is partly since many people kayak on a recreational basis, at local kayaking centres. But, if you plan to go kayaking in your own group. You need to know how to save yourself and others. This means everything from the right way to hold a paddle to rescue a fellow kayaker and what to do when you capsize in rough water. Being able to roll a kayak after it capsizes is literally a lifesaving skill. You shouldn’t be paddling choppy waters in groups, unless everyone knows how to roll a kayak. It puts an unnecessary burden on the rest of the group, not to mention putting the person in question in danger. Rule? If you don’t know how to capsize, keep going to local kayaking centres to get training until you can. Although we’ve outlined this in steps, remember the roll should be done in one swift movement. The first thing you need to understand, is body and paddle positioning. Safety first, you’ll need to do the equivalent of an abdominal crunch; your upside down and you don’t want to hit your head. 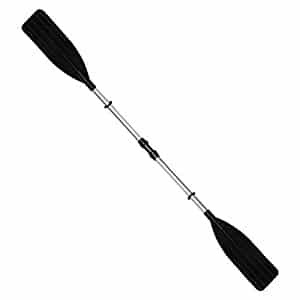 In the tucked position, you’ll need to angle your paddle so it’s along one side of the kayak (parallel). Next, tuck and stretch enough so your paddle starts to break the surface of the water. Now you’re as stretched as you can be, you’ll need to flip the paddle to a 90-degree angle. As you do this you’ll be keeping your bottom arm extended, but the aim is for your other arm to break the surface further with the paddle. As you go through this movement, put your head on the shoulder of the arm that is breaking the surface with the paddle. This sets up a position that’s going to provide power for the flip in the next move. You’re now in a position where you can maximise your body’s power. You’ll force your hips to provide power in the direction of the shoulder your head is leaning on. As you do this, you’ll break more of the surface of the water, which allows you just enough to dig the paddle in. You’ll naturally feel the effectiveness of your hips in the roll reduce, and as you do, you’ll switch that power into the blade of the paddle. Like any sport (golf, motorcycling etc), you tend to go exactly where you are looking (even if it’s in the wrong place). So, you want to keep your eyes fixed on the paddle, until the kayak begins to right itself, then move your focus to straight ahead. As you begin to surface, you’ll need to counter balance with your hips, otherwise you’ll be exactly where you started; upside down. Still unsure? Check out this video from Paddle TV. Paddling is one of the most important parts of kayaking. If you don’t paddle correctly, you could be putting yourself and others in danger (a paddle to the head hurts). Or, you’ll not have the technique to get yourself out of trouble. At the very least, you’ll be wasting valuable energy. It might sound basic, but holding the paddle correctly is extremely important. Not only will it allow you to execute a perfect stroke, but it reduces the chance of dropping the paddle. And, a dropped paddle is a pain to retrieve, not to mention a danger to others; they really hurt when they hit you! To utilise all your power in a paddle stroke, you’ll need the correct grip. The distance between your hands should be approximately the width of your shoulders. This is the most consistent positioning. A shorter grip will require less effort to paddle, but you’ll have less power. And, a larger spaced grip will increase power, but you won’t sustain that power for long. One of the most common mistakes beginners make, is holding onto the paddle too tight. There’s millions of litres of water below you, and you’re not going to be able to control all of it. So, go with a more relaxed grip, focusing on grip spacing and consistent paddling. Holding on too tight won’t allow blood to circulate round your fingers. That’s going to mean incredibly cold hands and cramp within a matter of minutes. Loosely connect your index finger and thumb to make an O. Have all your fingers in line with your index finger. That’s how you should be holding your paddle. And, then sit with your paddle so your knuckles are upward facing. Next up, you need to learn how to forward stroke. Getting this technique right is going to mean you have more power, for longer. It’s extremely easy to waste energy by paddling incorrectly. Although you’ll need plenty of power in your stroke, don’t make that the focus. It’s more important that you make each stroke smooth and consistent to provide maximum power. That way, you won’t burn out easily. So, you’ll want to make one fluid motion of putting the blade in the water and easing it past your side, rather than frantically paddling. Aim for an area on the side of the kayak that’s next to your feet. You’ll already need to be progressing in your stroke, as it enters. If you just jam the paddle downwards, the water will simply take your paddle, and you’ll have missed out on part of the forward stroke. As the paddle enters the water you’ll want to angle your torso to reach optimum power. When you paddle on the left side, you’ll angle your torso to the right (the left side of your rib cage will aim towards the front); and vice-versa. Use your torso, arms and shoulders in sync; this is how you’ll get the most power from your forward stroke. When paddling on the left, with your left rib cage aiming towards the front, slowly power back to a normal seating positioning, aiding the power with your arms and shoulders. As the paddle breaks the surface, you’ll be turning your torso the opposite way, ready for the next stroke. Once you’ve done this a few times, you’ll get to a point where the two strokes become one fluid movement. 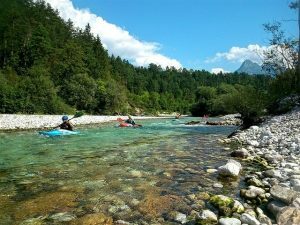 Regardless of the type of kayaking you plan to do, you’ll need to turn, whether that’s aiming for a landing area, to catch a wave, or avoid rocks in whitewater. It’s simple. If you drop your paddle blade on one side of the kayak and hold it there, that’s the way you’ll turn. A more complex turning method is the sweep stroke. This requires you to lean the kayak, and sweep in a smoother and wider arc. There’s a good reason for doing this. Simply dropping a paddle in and holding it there will reduce speed. And, to get back up to speed is going to take a lot of energy. So, you know how to paddle. You go for a few sessions, and realise one thing; your arms and shoulders are killing. I had the same thing with both kayaking and surfing. My paddle strength was just not good . And, that meant not paddling adequately (especially when trying to catch waves) and not paddling for long enough (on whitewater). I got tired quickly. Here are a few exercises you can do to increase the strength and power of your paddle. For all exercises, we’d be looking at sitting in the 14-18 reps range. That helps to achieve a nice mix of strength and stamina. And, for each exercise we’d be looking to do 3 sets, at least once a week. If you can’t manage this amount, the weights you are using are too heavy. If you are managing more reps than required, the weights you are lifting are too light. And, if you plan to do any of the exercises more than once per week, make sure you leave at least 3 days’ rest. This will allow muscles to repair. If you don’t allow them to repair, all your hard work will be wasted. Front raises help to improve your forward stroke. You’ll lift dumbbells from your side, so they are above a 90-degree angle with your body. If you’re not keen on a full-on workout just so you can go kayaking; once a week will be fine for front raises. I first started doing tricep pushdowns when I got into surfing. And, they made an enormous difference. They allowed me to catch waves I couldn’t before, and I’m 100% sure they help with forward strokes when kayaking too. If you’re on a budget, you can use a gym strap. Wrap it somewhere above your head and pull down. Make each movement controlled. Jerky movements will make the exercise easier, and that’s going to mean important muscles are missing out on a workout. If you’re not on a budget (or have access to a gym), it’s going to be a little easier. Another easy exercise that can be done with a set of light dumbbells. Start with the dumbbells by your side and lift them (but don’t strain) as high as you can go. You’ll feel the full benefit of the workout if you eat a protein based meal within an hour of your workout. When you work out, muscles will tear. When they repair, they’ll come back stronger. And, protein helps to rebuild and repair muscles; fast. Looking to read up on everything to do with kayaking? Look no further than Canoe & Kayak’s online magazine here. If you plan to stick to the sea when kayaking, head over to Oceankayak.com. There’s some cool surfing kayak videos over at Kayak Experience’s YouTube channel. If you’re looking for something a bit more informational, then look no further than Paddle TV. They’ve got a great range of instructional videos from “How To Get Into a Kayak” through to “Facing Waves”. Thanks for reading our 10-Minute Guide To Starting Kayaking. And, don’t forget to jump on our email list for kayaking tips and special offers.